Santa Rita, Alto Paraná--October 30, 2008--Transgenic soybean and seed producer Onorio Guntzel, a Brazilian of German ancestry, in the warehouse his company uses to store herbicides, pesticides and other chemicals for use in their agricultural production. 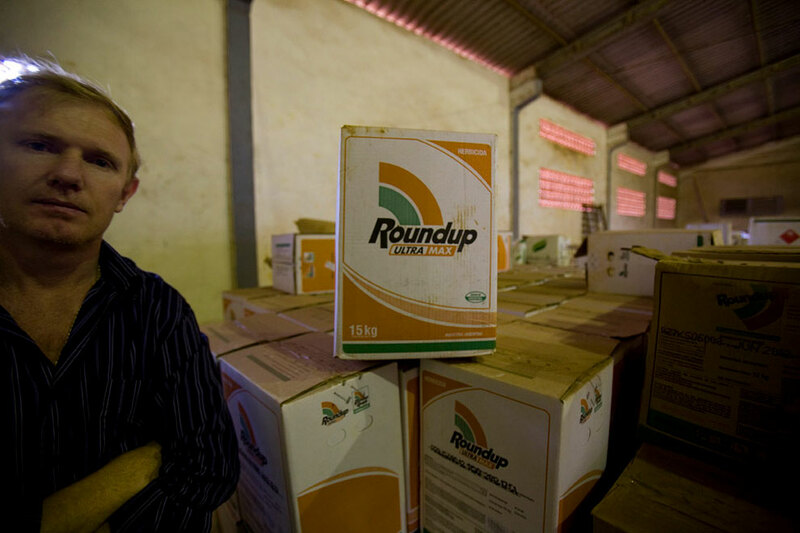 In Paraguay approximately 90% of the soy produced is transgenic Roundup Ready RR, a variety patented by the U.S.-based Monsanto corporation to be resistant to their patented herbicide Roundup. Fields of RR soy are fumigated indiscriminately with Roundup or other pesticides with a glyphosate base, killing everything in their path except the Roundup Resistant soy itself. According to Monsanto representatives, Roundup contains the same surfactant as its parent compound, a chemical known as POEA (polyethoxylated tallowamine), along with other "proprietary" chemicals as a blend. POEA is about three times as toxic as glyphosate in standard toxicity tests, and causes gastrointestinal as well as nervous system damage, respiratory problems and destruction of red blood cells in humans.